On Monday the 16th 1A went on their expo two. It was really exciting since we were the first to go on our expo and we all couldn’t wait to get going. We got dropped off half way up Mt Raymond where we were going to walk the rest of the way up. That day I was the team organiser and I was really excited to get going and organise the team for the day. The walk up was really relaxing and most of the hike wasn’t even that steep apart from a couple of hills that were really bad but we all got over them with each other encouraging. Yesterday Doncadown had our last team activity ‘Raft Building’. It was a lot of fun, we made our last time together as a group fun and exciting. We all got dressed up as pirates. Today I had intro to POL which was pretty good. We have to do a fifteen minute presentation on what we have learnt for the nine weeks. We talked about stuff like how our views on being a leader has changed, how your beliefs and values have changed and what sort of things you have achieved while at SRC. Everyone has decided to do the presentation different ways and I have decided to do a power point. I still can’t believe it’s only two and a half weeks before we go home. I am having heaps of fun at snowy river campus and I don’t want to leave! This is a picture of a flower for very obvious reasons. This was taken on my second expo. It was up on Mount Raymond. I got the inspiration for this picture from my Dad. The night before was parent visiting weekend. I was talking to him about the different type of lenses of his camera and one was for close ups and he mentioned taking close ups of flowers in the wild. It was on the side of the mountain in a little in closed section. I really like this photo. It was a difficult to take because the camera wouldn’t adjust to the right setting. I would like to say hi to whoever is reading this. Hope you enjoyed the picture. This is a photo of my expo team, 2A. The photo represents all of the memories I’ve had with these people. Through the good, the bad, the funny, the depressing and so on. It has all been worth it! I only have another two weeks with these awesome guys, so I’m going to make the most of it. I will most definitely keep the memories I’ve had with our team. If it weren’t for these guys I wouldn’t have learnt what I have and I am most thankful for them!! This is a photo of Brett (left) and I (right) dancing together at the disco night Brett and I thought we would have some fun and dress up in whatever purple we could find in the dress up box. The only purple cloths we could find in the dress up box were women’s cloths, we picked them out, looked at each other and said what the hell l et’s just do it! Today Camperdown had wet duty so Brett, Jimi and I all turned up at the bathroom to be welcomed by Mr. Smart, a lovely sight in the morning. This is Mount Raymond (the one with the tower on top) this picture was taken from where we started from. That is where we had to walk and canoe to on our 2 expo. Not long into my SRC experience I was off on one of the biggest challenges I thought I would face. It was my first expo. So finally the day arrived and it was off along the never ending beach. At first I was a bit nervous but as the day went on I realised that it was actually quite fun. Although at some stages my pack got extra heavy and it was hard to stay positive, I made it to the end of the beach. That night we stayed at Banksia Bluff campsite. The next day was easy and a lot of fun. We slowly made our way back, after spending around an hour and a half at the Yeerung River for lunch. When we arrived back to SRC I realised that Expo 1 was definitely one of my highlights from the 9 weeks. On Thursday morning my group, 2B, went surfing for the second time. I was hoping that the water wouldn’t be too cold because I knew that I would enjoy myself more if I wasn’t freezing. Fortunately we had beautiful weather and I barely felt the temperature of the water at all through my wetsuit. Once upon a time a team called 1B and one day this team went on expo 2. On the second night of their exciting expedition, they came to a paddock; the paddock was filled with an equal ratio of cows and their poo. Here, however an unlikely place, they decided to set up camp for the night. Next to the proposed campsite there was a river and above this river was a courageous bridge. All year round the bridge safely allowed human and machine alike across the river. From this bridge two soon-to-be-men hung their rods in hope to provide their team with sustenance. The whole team watched with bated breath to see if the boys could prove themselves and produce a fish. But one member, it seemed, didn’t want to be a spectator, she decided to leave the pack and in doing so, showed the others that she was strong enough to stand alone. It was hard for her to break away but in every person’s life there needs to be time spent absent from others, to make sure that you are not reliant on those that can let you down. My Awesome Day at SRC!!! Today 1B went had a class called enviro bikes. This involved a drive out to an old logging coupe and then a ride back from there. The logging coupe was really interesting and I learnt a lot about how we can reduce our dependence on the forest and timber products. Today 2A hit East Cape beach in Cape Conran. We were all eager to get into the water so grabbed our boards and chucked our wetties on. Our knowledgeable surfing experts, Mel and Pete, helped us with our surfing facts. This is a photo of 1a’s team of Doncaster and Camperdown‘s (Nick name Doncadown) completed bridge. We made a great start to our snowy river experience. We worked well as a team encouraging and supporting everybody throughout the day. We worked well as a team when we were doing the things like tying the knots for the tripods, frapping the pole to the tripod and even moving the tripod into the water. I was surprised how well we worked when we only knew each other for 4 days. We communicated better than we all expected. We made sure that everybody had a go and made sure that nobody was excluded. In a team there are lots of different personalities and everyone is still finding themselves. Being in a team we all help each other in the great exploration of 'self’. Everyone has different strengths and we all complement each other. We also describe our weaknesses and think of many ways we can improve them. This team is an ideal environment for one to find ones’ self, as there is a team watching their back! Our footprints are embedded into the sand, along with our hearts and hard work. To me this photo represents how far Doncadown has come, from a group of strangers to a team of friends. When one of us struggles, the rest of us struggle with them and when one of us succeeds, we succeed with them. Today was our rest day. 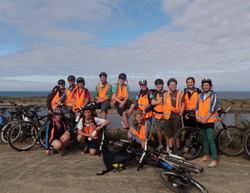 In the morning, some of the students went on a bike ride. A group of students went to Lakes Entrance for a swim and the rest of us just stayed at the campus. It was really great getting to catch up with my parents and brother (James) again. I straight away started telling them about everything we had done at Snowy so far. Tonight for evening class we had the bush dance. Everyone dressed up in their flannels and got their dancing shoes on! Now, you’d think that Friday the 13th would have been an unlucky day, but it wasn’t. But no pressure when the community is in Step Up mode! Step up is the trial day where students step up and the teachers step back, so being student leader is tough, because the bar is being raised high. However, it was like any typical day and things ran smoothly, mainly because the students knew that the teachers were counting on them. Another good thing about Friday 13 was that it was the day before parent visiting weekend! Getting to re-connect with our families was pretty special for everyone and eating lots of junk food was good too!! Well today was rest day and I had a very relaxed day, but Jess and I had conjunctivitis. I was on my second day of it and jess was on her first, because of this we couldn’t go swimming. But other than that I had great day. Some people went swimming; some road bikes and some went fishing. Me and others went for a walk to zone 3 and hung out with the cows for half an hour or so. Tomorrow I have LLP prep and Indigenous walk. We had pancakes for breakfast!!! IT’S 4 DAYS TILL PARENT VISITING WEEKEND. Everyone is very excited. Here’s a photo of me at the rainforest walk. Today was my first day as student leader, I was paired with Shaun. At first I was completely freaking out, but as the day went on it really wasn’t as bad as I thought it would be. Our morning class was the Marlo challenge. We got put into groups of 5 and went on a hunt around Marlo to try and take photos of the clues we saw back at the beach. Today all but 12 of the SRC students left, either to go canoeing or on their expo. I was lucky, as being student leader of a small well-known group is much more manageable than a large one. Today was a rest day. We get a rest day every Saturday which pretty much means we can do whatever we want (to an extent). This rest day, I chose to go to Yeerung River with a few other people. We went swimming (briefly) in the freezing cold water and saw who was daring enough to swim to the other side. We also played beach cricket and kicked the soccer ball. When we got back we had a ton of free time to relax, read a book, have a chat and send emails. Everyone is looking forward to Calamari tonight. YUM!! It was a great day all round. Today was our first day as student leaders. It wasn’t as bad as I thought it would have been. We didn’t have to say much but it was still pretty fun. Picking tables at meal times was not fun considering everyone begs you to pick them. We had to do the link up with the other two campus’s which was embarrassing and we didn’t really talk much. We have Marlo Challange tomorrow which will be fun. It was great being student leader today because it gave me a bigger sense of leadership and helps a bit with speaking in front of everyone. I thought the link up was great because it showed you that you are not the only person who is being student leader. I thought the staff meeting was good, because it gave me a bigger sense of belonging and helped me fit in a bit more with teachers that I don’t normally talk to. I am looking forward to do student leader again because I already know what and how to do it. We were all excited to see if we were going to achieve the goals we set as a team to accomplish for bridge building. Those Goals were Co-operation and Patience. With both of our goals I reckon we went really well especially Co-operation because we communicated together really well and everyone’s ideas were getting heard. Coming to Snowy River Campus, School for Student Leadership has been the best experience I have ever done. I have made so many friends and learnt so many different skills. I have really enjoyed a lot of activities such as surfing (all four lessons have been so much fun), caving (it was an experience that I have never done or experienced before, Environmental bikes (it was great to push myself to ride that 28km and after I had achieved it, it was a great feeling, I enjoyed it), Expo 1 and 2 (Before coming here I had never really been camping before so it was great to go for the first time. It was a lot of fun and I really enjoyed it). Coming here has been a once in a life time opportunity and I’m so glad that I was one out of 6 students from my school that got the chance to have this experience. I will never forget all the memories I have shared and all the friends I have made. Today was our first day as student leaders. We had a rest day so we had to organise a movie (The Benchwarmers). We did a video call and Dinner Plain was hosting it. That was pretty awkward because it was the first time we had done it and we didn’t know the other people. On the first of November 2009 Callum, Erica, Blake and Sheydin held and ran a Raft Race Day at our local recreational lake, Green Lake. The idea of the day was to help celebrate and show how much the filling of Green Lake meant to the community after it had been dry for the past 10 years.